Loyalty programs encourage repeat customers who spend more on their purchases and return to your winery more often. Reward club members at different rates, or make points earnable across your entire customer base. Loyalty Points are configurable to meet your needs and can apply to any SKUs in WineDirect so you can create a memorable brand experience for your customers. The legality of loyalty programs varies from state to state. WineDirect does not accept liability for the use of the tool and clients are encouraged to seek legal counsel to ensure compliance before enabling the feature. 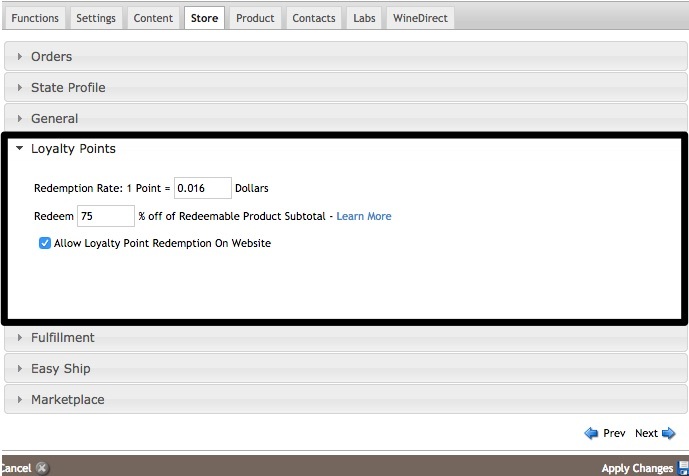 You need to set a Redemption Rate in order to create a Loyalty Point program for your winery. The Redemption Rate is how much each point is worth for every dollar; if you have a SKU with a retail price of $50 and the Redemption Rate is set at $0.016, your customer will need 3,125 points before they can redeem that product for "free" ($50 / $0.016 = 3,125). Navigate to Settings > Website Settings > Store > Loyalty Points to set your desired Redemption Rate. We have set a default redemption ratio of $0.016. This is an average rate in comparison to other loyalty point programs in the retail industry, but you can adjust this value to suit your needs. 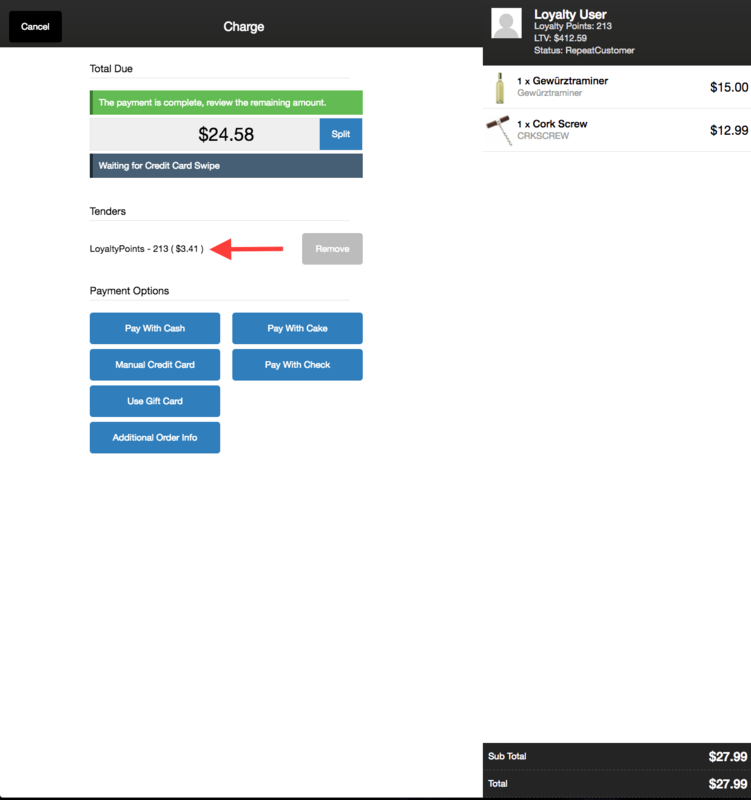 In this section you can also choose to disable Loyalty Points from displaying on your ecommerce website; if you disable redemption on the website your customers will only be able to redeem points for purchases via the POS and Admin Panel. You can also set a limit to how much of an order subtotal can be eligible for redemption to meet compliance laws in your particular state. For example, if you set the limit to 75% and have an order with a $100 subtotal, your customer will only be able to redeem $75 in points on the purchase and will need to pay the remaining balance with another tender. Tiers allow you to configure how many points you would like your club members to earn on their purchases. By setting up different Tiers, you can reward members of certain clubs at different rates than others. Navigate to Store > Loyalty Points to set up your Tiers. Select ‘Add a Tier’ to create a Tier. This is where you will determine how many points your club members should earn per dollar spent. Name your Tier and enter the Points Earned Per Dollar, then ‘Save’. Most wineries will set up 3-4 Tiers at different earn ratios. For example, a Gold Tier could earn 10 points per dollar spent, a Silver Tier could earn 5 points per dollar spent, and a Bronze Tier could earn 2 points per dollar spent. 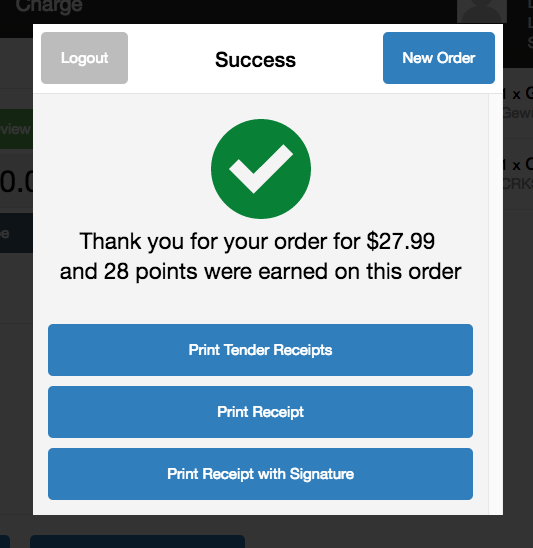 Customers will earn points on all purchases made via POS, webstore and the Admin Panel. Associating your clubs with each of your Tiers allows you to customize which club members earn which point values. You can add the same club to two different Tiers, and if a customer is a member of both they will receive the more favorable (higher) earn ratio. If you do not wish to allow all customers to earn points, keep the Default Tier earn ratio at 0. A Default Tier will appear in your Tiers settings by default. If you want all of your customers, not just your club members to earn points, the ‘Default Tier’ is where you can enable the default earning ratio. If this value is set above 0, all of your customers will earn points at the ratio you set unless they are a club member and apply to one of your other Tiers. If a customer belongs to a Tier with a higher earn ratio that will override the ratio in the Default Tier. Your contacts do not need to be within a club in order to be assigned to a Tier. All contacts will belong to the Default Tier by default (if this is set to 0, these customers are not earning points). You can, however, manually upgrade individual contacts to a Tier and they will earn loyalty points at that Tier’s earn ratio. If the contact later adds a club that is associated with a Tier with a more favorable earn ratio, the contact will not automatically earn the more favorable rate. Navigate to the contact record and select ‘Manage Loyalty Points’, then edit the Tier section and manually add the Tier that you would like this contact to belong to. By default, your SKUs will not be opted into the Loyalty Points program. This means that your customers will not be able to redeem products for points unless you opt them in. For the products that you would like to be redeemable for points, navigate to Store > Products. 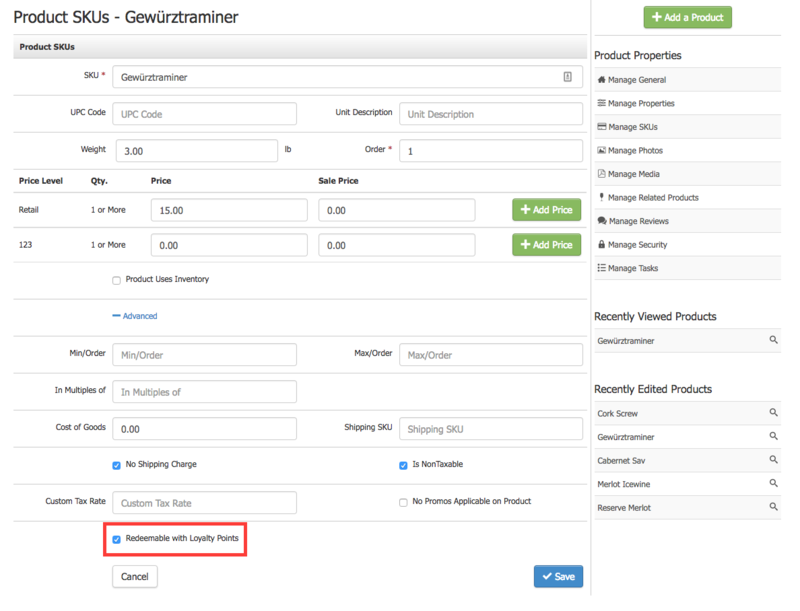 When you edit the product under 'Manage SKUs', click 'Advanced' and then check off 'Redeemable with Loyalty Points' for that SKU to be opted into the program. Navigate to the contact record of interest and select ‘Manage Loyalty Points’ to view the contact’s transaction history as well as their points balance. 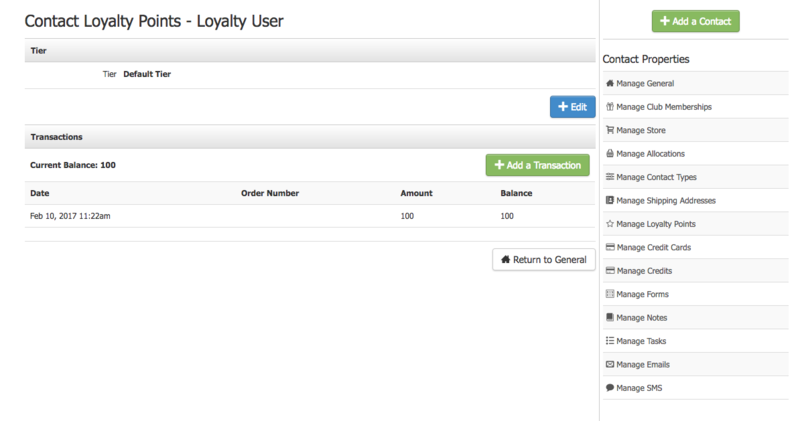 You can also manually add or remove Loyalty Points in this section by clicking 'Add a Transaction'. Your contacts will also be able to see their points balance within their account on your website. When you process an order in your Admin Panel, POS or website for a contact that is linked to a Tier, they will earn points based on the Tier they belong to. Points are calculated from the subtotal of the order. If you refund this order, the earned points will automatically be removed. Your staff can help customers redeem Loyalty Points for eligible SKUs using the Admin Panel and POS. If website redemption is enabled in Website Settings, your customers will also be able to redeem points via your ecommerce site. Points act as a new payment tender, much like gift cards operate in WineDirect today. They can be used as a split tender on an order, though a contact must have sufficient points earned on their contact record in order to redeem points for a product. Since SKUs need to be opted-in to be redeemable for Loyalty Points, you may have orders that contain some SKUs that are eligible for redemption, and some that are not. Points will only be redeemable on the Reedemable Product Subtotal, or the sum of the retail price for the SKUs opted-in to be redeemable for Loyalty Points. If Promos are used on the order, the promo will apply to reduce the price before it is considered the Redeemable Product Subtotal. You can also choose to limit what percentage of the Redeemable Product Subtotal can be redeemed for points to meet compliance regulations for your state. Compliance guidelines on redeeming products for points vary from state to state. You can limit what proportion of the Redeemable Product Subtotal should be redeemable for points to adhere to your particular regulatory environment via Website Settings > Store > General. Leave this at 100% if you do not wish to restrict the redemption proportion. For example, you could set the percentage explained above to 50% off the Redeemable Product Subtotal. You have an order where Product A is redeemable for points and has a retail price of $100. Product B is not redeemable for points and has a retail price of $40. The subtotal of the entire order is $140, and the Redeemable Product Subtotal is $100. Since you set your redemption limit to 50%, your customer can then redeem points to receive 50% of the Redeemable Product Subtotal, or $50 off of their order (50% of $100 = $50). Their new subtotal would then be $90. 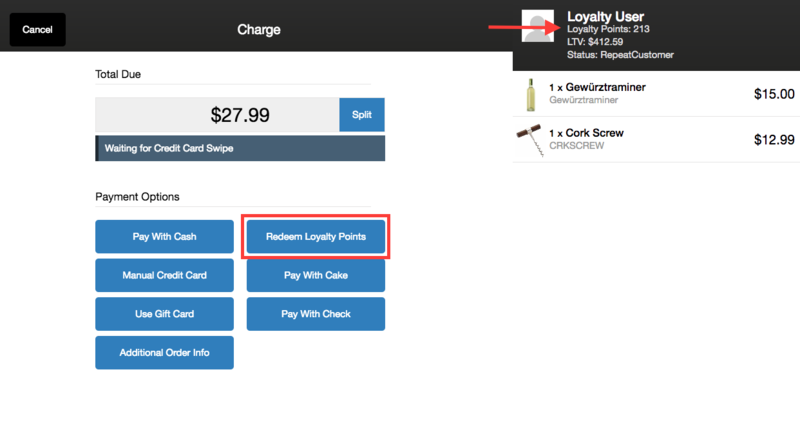 Since Loyalty Points are designed to be configurable to meet your winery's individual needs, marketing of your loyalty program is up to you. You can decide how you would like to promote your opted-in SKUs to your customers and communicate with them in the way that works best for your winery. To assist you in segmenting your marketing emails to reach members with loyalty points, you can use the Points Summary report found under Contacts in enhanced Reports. You can also include the //LoyaltyPointsBalance// auto-populating tag in your Send Mass Email and Send Club Email marketing communications (coming soon). Process your order via the Admin Panel as you usually would and select LoyaltyPoints to redeem Loyalty Points on an order. Add an item to the cart and upon checkout, select 'Redeem Loyalty Points' to redeem Loyalty Points on an order. To make the most of the Loyalty Points feature, you will want to develop a marketing plan for the roll out of your winery's unique program. We understand that this takes time, and that you'd still like to test out the feature before you begin marketing to your customers. Test out the program by opting in SKUs, processing orders and redeeming points for purchases using your test contact and cash transactions. Make sure you keep track of order numbers so your accounting team can remove these from your books when you're finished testing. When your marketing plan is all set and you're ready to launch your program, create your additional Tiers and configure the feature to best meet your needs. What part of the order total are points earned and redeemed on? How do I change the ratio at which customers redeem points? Can the ratio at which customers redeem points change based on the Tier they are in? How are club members that are canceled or on hold affected by Loyalty Points? Where are points redeemable in WineDirect? Will Loyalty Points be included in reports? Are points accumulated through external vendors i.e. RMS, RMS Web Window, Webservices, Marketplace etc.? Are points accumulated through order history imports? Do points work across multiple child sites for one parent brand? How does billing work for this add-on? Why is Loyalty Points an add-on feature? Loyalty Points are earned and redeemed on the subtotal of an order, and do not impact shipping or taxes. The redeem ratio can be adjusted under Website Settings > Store > General. The default value of $0.016 is an average of other Loyalty Point programs in the retail industry. The redeem ratio cannot be altered for different Tiers, all members within a Tier will have the same redeem ratio set up under Website Settings > Store > General. Club members that are in a club associated with a Tier, and are on hold with benefits, will be able to earn and redeem points. Canceled members will not be able to earn points (unless you have your Default tier enabled) but they will still be able to spend any points they previously accumulated. 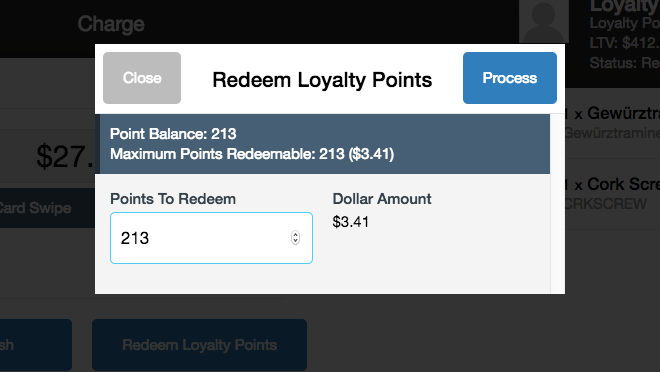 Loyalty Points are redeemable via the Admin Panel, POS and ecommerce websites. You can choose to disable redemption via your website through your website settings. Yes. 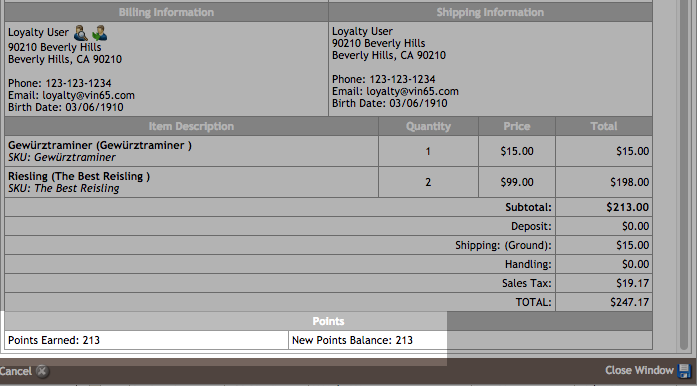 Sales reports will have new columns including Points Redeemed, Points Earned and Dollar Value of Points Redeemed. 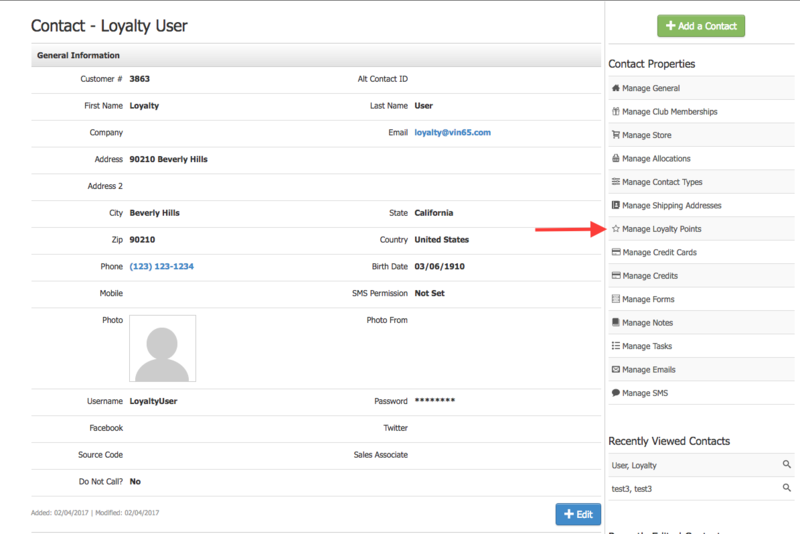 You can also use the Points Summary report found under Contacts in enhanced reporting. At this time points are not accumulated through external vendors. Points are not accumulated through order history imports. Points are accumulated and redeemed on only one brand. Loyalty Points is free on the Plus and new Enterprise plans. For Lite plans the feature is available for $199 a month. Loyalty Points may not be applicable to all wineries so is not included in our basic packages. To integrate an external loyalty rewards feature to WineDirect would cost wineries upwards of double the monthly fee, not including the cost of the integration. For one price that fits the size of your winery, we built this in so you benefit from a loyalty feature directly in one platform.